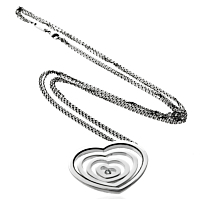 A gorgeous modern heart necklace from Chopard's happy diamond collection. 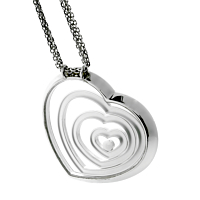 Three open hearts, in varying sizes, nestle inside a larger heart, all in 18kt high polished white gold. The group uniquely drops at an angle from the white gold chain and is adorned with a single round brilliant cut diamond.